On Friday we learn that a fake bomb made in the USA was responsible for a terror alert on a Munich bound plane from Namibia on Thursday. When a suspicious package was identified at Windhoek airport in Namibia on Thursday, the flight was halted, the Munich-bound passengers delayed and news sped round the world that an x-ray scanner had been found with batteries attached by wires to a detonator and a ticking clock. Today, however, a German government minister revealed the bizarre truth: the bomb was fake, manufactured in the US to test airport security. It was not yet clear who had planted "test suitcase", the German interior minister, Thomas de Mazière, said, but the one fact they had established was that the device had been manufactured by a US company that specialises in alarm systems. At no time were passengers' lives in danger. Do you believe that it is "not yet clear" who planted the "test suitcase"? One would think they could answer that question given that they know the identity of the US company specializing in alarm systems. Come now. Let us have the names. At least the name of the company that manufactures test suitcases...? No it's a BIG SECRET. That could be embarrassing. That could lead to some google-fu. So notice how that information stays protected by the media. Instead we are told it is "not yet clear." The US transportation security administration (TSA) confirmed today that it was working with the German and Namibian authorities "to determine the origin of the device and the reason it was being transported on the plane". Perhaps the REASON is simply to spread fear around the world....? To MANUFACTURE fear...? According to tests by the German federal criminal police, the suitcase did not contain explosives. German security experts said yesterday it was most likely that either US or African authorities were behind the test, following the discovery of several parcel bombs sent from Yemen to the US. And yet Namibian authorities say something else. 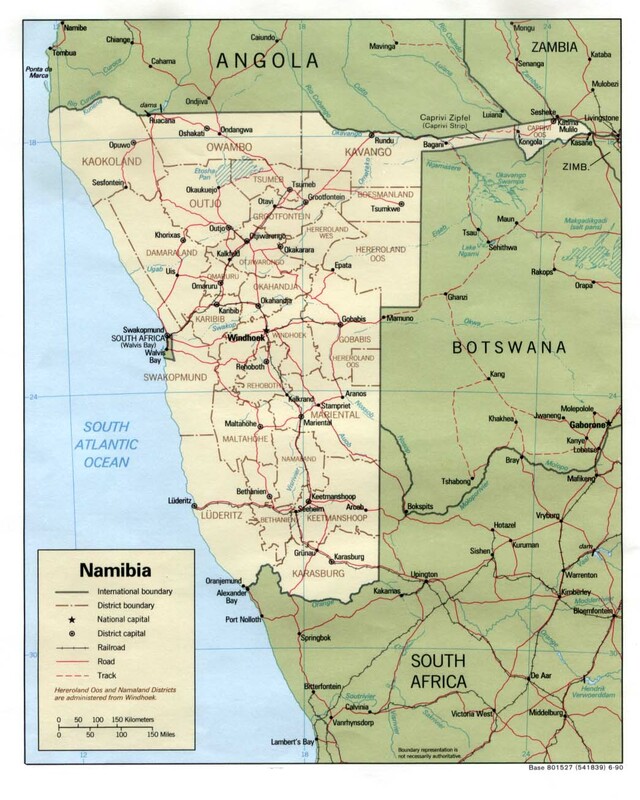 Namibian police said neither the US government nor the German or Namibian governments were behind the security test. "It will be determined who deposited it. The governments of US, Germany and Namibia were not aware of the parcel," police inspector general Sebastian Ndeitunga told reporters. "It is devoid of truth that the US government put the device there to test how good the Namibian security is." So who was behind the security test? And will they be held accountable? Or is it all going to be brushed under the rug? 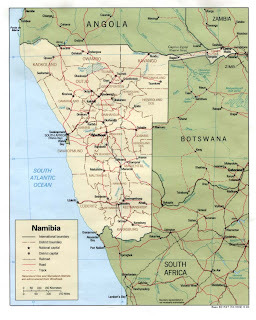 Who is in Namibia besides the Namibians? Namibia is a sparsely populated country with incredible raw beauty and mineral wealth. Namibia is the world's largest diamond producer. Namibia has uneasy ties with Israel. With the collapse of the Soviet system, politics has been transformed into a uni-polar world and it is difficult for small states like Namibia to go it alone. The best option, says Kaapama, is to partake in multilateral initiatives with regard to the Israeli/Palestinian issue. Asked what benefits Namibia gets from such a relationship, Kaapama said the government strategy is to solicit foreign direct investment and that is perhaps why the country has entered into such an arrangement. There are Israeli companies doing business in Namibia, notably LLD operating in one of our core sectors of the national economy - the diamond sector. It is now easily forgotten in political circles that during the dark days of our liberation struggle, the liberation movement and activists in both Namibia and South Africa campaigned intensely against companies and countries that had economic and diplomatic ties with SA. By giving diamond concessions to a top Israeli company and by maintaining diplomatic contacts with the Israeli state, Namibia is actually sabotaging the struggle of the Palestinian people under the PLO and other groups. A few weeks ago, a top Israeli company, Lev Leviev Diamonds (LLD) and its numerous subsidiaries, were given 36 concessions said to be worth US$180 million by the Namibian government. In fact, Lev Leviev was brought into the country and paraded by President Nujoma and his ministers as a foreign investor and as someone who would save Namibia from the jaws of De Beers and make the country independent and proud because LLD would be the first company to mine and process Namibian gems locally. ...The point is that Leviev is coming to extract and exploit our natural resource.What Nujoma, his Ministers and advisors (if he has any) seem to forget is that both the hippo and the crocodile can happily live in the same river and so will De Beers and the Lev Leviev Diamonds.LLD is one of the biggest sponsors of the Israeli state and Jewish activities worldwide.Leviev himself serves as the President of the Federation of Jewish Communities.It is therefore clear that by giving diamond concessions to this man, Namibia has turned its diamonds into "blood diamonds" - being used to maintain the Israeli occupation of Palestine. It is now totally forgotten that Israel was a big supporter of the then Apartheid State in its fight against independence for both Namibia and SA.And in terms of its brutality against the Palestinian people, Israel's methods of suppressionhave surpassed those of South Africa. It's been a while since we've written about Lev Leviev and his connections to Putin, Chabad, etc. It started here, while looking into the Saudi jewels, including a blue diamond, that went missing some twenty years ago and ended up in Thai high society. Several Saudis were killed trying to solve the case. We see that Lev Leviev has diamond interests in Namibia. What other Israelis are in Namibia? We note that last week, the day before the fake bomb incident, Namibia dropped charges against an Israeli national for diamond theft. THE charge against the Israeli national who was the only person so far to have been arrested in connection with the theft of diamonds worth millions of dollars from the NamGem diamond cutting plant at Okahandja was withdrawn yesterday. Ten weeks after being arrested and charged with a count of theft of diamonds, Erez Ben Shushan (47) is a free man again after Prosecutor General Martha Imalwa decided to drop the charge against him. Ben Shushan was working at the NamGem diamond cutting plant at Okahandja when diamonds worth close to N$20 million were found to have disappeared from a safe at the factory during the weekend between September 3 and 6....Ben Shushan, who is employed with the American company Lazare Kaplan International, which is a partner of NamGem, was charged in connection with the disappearance of 1 036 polished and uncut diamonds, weighing 1 713 carats and reportedly valued at US$2,64 million (about N$18,4 million), from the NamGem safe. He had been free on bail of N$100 000 since September 9. Belgian diamond firm Lazare Kaplan International is controlled by Maurice Tempelsman. Both Leviev and Tempelsman entered the Namibia diamond cutting market in 2004. The diamond cutting industry looks like perking up sharply in Namibia. Of the seven polishing firms in Namibia, at present only two are operating. Two newcomers are about to enter the sleepy market. Lev Leviev is to begin production in Namibia's offshore after taking over some assets previously owned by the liquidated Namco. His firm, LLD Diamonds Namibia, plans to open a new cutting unit near Windhoek. It will be supplied directly by the diamonds produced by Leviev. Maurice Tempelsman, the famous diamond dealer, who is close to De Beers, has just finalised a new technical and commercial cooperation deal with NamGem, the cutting affiliate of Namdeb which has been losing ground of late. Under this agreement Tempelsman's firm Lazare Kaplan International Inc will supply NamGem with uncut diamonds and pay NamGem to cut and polish them. Lazare Kaplan will then sell them on its own account. The operation will lend impetus to NamGem and come as a relief to De Beers, which owns half of Namdeb-NamGem's parent company-and had promised the Namibian government to develop the cutting trade. This never came about, and now Tempelsman is stepping in. According to Africa Mining Intelligence, these two new operations will compete head-to-head. We learn from a November 2007 Global Research article by Keith Harmon Snow that Tempelsman has a long history in Africa and connections to the Israeli military. ...Since at least 1996, the campaigns of Russ Feingold (D-WI), who co-sponsored the Senate version of the U.S. “Clean Diamond Act” passed in 2003 have been heavily funded by Leon Tempelsman & Son. Diamond are Israel's top export. Of course, Israel first IMPORTS ALL the diamonds from places like Namibia and Angola, where they get them real cheap and dirty. So we have established the presence of Israeli oligarchs in Namibia with connections to Mossad and the Israeli military. And we already knew that Israelis are "experts" in airport security. We think it would be very interesting to learn which American security company (a California company according to the NYT) prepared the real test suitcase, and how exactly it got on that plane in Namibia. So far ONE person is being held, a Namibian. The nation’s police commander, Lt. Gen. Sebastian Ndeitunga, said a senior Namibian aviation security officer had been arrested in connection with the mock bomb found Wednesday in a laptop case at the airport there. But, he said, the investigation was just beginning into how the device, which was made by a California company to test airport security, ended up at an airport halfway round the world. “We’re still trying to establish the motive behind this mess,” he said. The officer was arrested after a review of closed-circuit camera surveillance, General Ndeitunga said. The suspect, whose name will be kept secret until Monday, confessed to some involvement in the case, the general said. General Ndeitunga said the possibility that the security officer had accomplices had not been ruled out. “We do not consider this to be a joke,” he said. Meanwhile, the Germans are busy looking for Al Qaeda terror suspects from Pakistan. BERLIN — German law enforcement officials said on Saturday that they were looking for two suspected terrorists thought to be in or around the capital city in one of several investigations aimed at thwarting what the authorities believe are myriad plans by Islamic radicals to attack the nation. They have information that two men entered Germany six to eight weeks ago from Waziristan, in Pakistan, and were awaiting delivery of detonators, perhaps from Turkey, to carry out an attack, a German security official said. We might pause here to reflect on how they would know all these details. And wait, that's not all they know. They know that the Islamic militants are connected to Dawood Ibrahim and are planning a Mumbai-style attack on the German Parliament building. A group of al-Qaeda terrorists trained in Pakistani camps and assisted by underworld don Dawood Ibrahim are planning to storm Germany's Parliament in a Mumbai-style attack, a media report has said, prompting authorities to step up security of the building. Police have cordoned off the area around the historic Reichstag building housing Parliament here and heightened security after authorities received a tip-off that a group of militants were on their way to stage a Mumbai-style attack. ...The warning about the planned attack on the Reichstag came to the Federal Criminal Office (BKA) from a German Islamic militant, who slipped to Pakistan some time ago to receive training in the terrorist camps there and now wants to return to his family. However, German Interior Minister Thomas de Maiziere issued a separate warning about "concrete evidence" for an attack by Islamic terrorists at the end of this month on the basis of a second tip-off received by the BKA from the US Federal Bureau of Investigation (FBI), the magazine said. The US domestic intelligence service warned that a Shiite militant group called Saif had entered into a pact with al-Qaeda to carry out an attack in Germany and two men dispatched by the group were waiting to enter Germany via the UAE on November 22 with Schengen visas, Der Spiegel said. The FBI has identified Mustaq Altaf Bin-Khadri as the mastermind behind the plot and he is assisted in getting the men across to Germany by weapons and narcotics smuggler Dawood Ibrahim, the report said. About a year ago, Aangirfan reported on Dawood Ibrahim, a gangster from Bombay, and David Coleman Headley. We have since learned that people tried to report Headley's suspicious behavior to American authorities SIX different times, to no avail. Because Headley is on the payroll. All major terrorist attacks are state-sponsored. If another major terror attack comes, and we expect so, it will be state-sponsored too. Look to the usual suspects. Maurice Tempelsmen was Jackie Onassis' partner from Onassis' death to the end of her life - her longest partner. ferris you are the master of arcane details. Here's some pics of Viktor Bout after his spell in Bangkok. He's put on a lot of weight. Since Jackie was so wonderful , famous and icon of USA it seems funny that her longest partner is generally unheard of. ha, what a doughboy. what will he look like after all those cheeseburgers on mafia row?! totally agreed about these people who manage to stay under the radar. it is all made possible by the media surprise surprise.